With a few helpful tips for teaching children with autism in school, parents and teachers can ensure that students get the education they deserve. Children with Autism learn differently than mainstream children, but their education is just as important. Children with mild autism may perform well within a standard classroom setting. Children with severely autistic characteristics may need a specialized environment. In either case, the following tips can improve their overall experience. Note that not all tips will work for all children. Tailor Expectations to the Child: Rather than having a rigid lesson plan with pass or fail expectations, allow children more flexibility. Children with autism may need additional time and explanation before grasping a topic. Use custom learning plans that expand as the child masters skills and is ready to move on to the next level. Make transitions between subjects and difficulty levels as smooth as possible. Visualize Concepts: Many children learn visually. Rather than having to think in language, these children see pictures. When teaching a concept, use pictures whenever possible to demonstrate points. A picture of a noun is easier to understand than simply hearing the noun's name, for example. Use Fixations as Motivation: One of the challenges many children with autism face is distraction. The child may become fixated on a particular item and want to talk about it extensively, even if the lesson plan needs to move forward. Use this as a motivation tool. A fixation on cars may lead to a math problem in which the child determines the number of cars in a lot through multiplication, for example. Teach Math with Visualization: Math is a difficult concept to visualize. Give the child the best opportunity to succeed by using manipulators. Blocks, for example, can teach most basic math equations. It allows the child to visualize the concept. This can also be helpful when teaching geometry and some forms of algebra. Use Familiar Objects: Incorporate special or personal items into the child's lesson. Children find comfort in familiar objects, and using those objects during teaching can increase interest in learning. For example, if the child has an interest in trains, you can develop counting skills using small trains or pictures of trains. Keep Instruction Simple: Avoid long sentences and instructions that include numerous minutes to explain. Rather, focus on simple instructions whenever possible. If teaching a concept on nutrition, have the child simply match the pictures with the nutrients rather than cutting them out, coloring them and then pasting them in place. Give Verbal and Written Instructions: Provide both written and verbal instructions to older children who can read. Many children with autism have difficulty following instructions with more than three steps. By writing down the instructions, the child is more likely to remember the sequence of expected events. 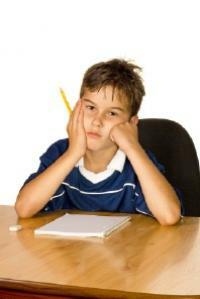 Incorporate Technology Usage: Allow the child to use a computer if he becomes frustrated trying to write by hand. Computers and accompanying software and games make excellent tools for teaching children with autism in school. Consider Learning Style: To teach children with autism successfully, you must consider the individual learning style of each child in the classroom. Some children may be visual learners, while others may respond better to auditory lessons, such as lectures or learning through songs. 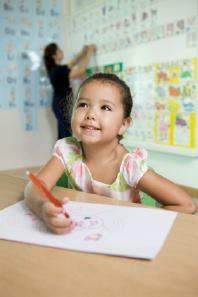 Other children may be kinesthetic learners, which means they learn from actively participating in the lesson. Follow a Routine: Stick to a classroom routine. Make certain your student knows what to expect at every point in the school day. Lessons, free time, lunchtime, and other activities should occur at the same time every day. This also applies to any speech or occupational therapy the child may receive while at school. Many children with autsim are aware that they are different from the other children in the classroom. This creates a social breakdown in many instances. While the tips for teaching children in school listed above will help, it is also important to consider the social aspects a child with autism needs to learn. Do not overemphasize the child in class. Making them stick out will not help them to perform better. Realize that children with autistic conditions have a difficult time related to the feelings of others. They may not understand them. Know when to defuse problems with other classmates. A sensitive child could take the lack of emotion or the inquisitive nature of a child with autism wrong. Providing social interaction as appropriate for the child, based on the curriculum that child needs. Each child may require a different level of attention and social interaction. In situations where the child cannot be part of a group situation, provide other activities for that child. Remember that children with autism may be hypersensitive to certain sensory stimuli, and consider this when setting up your classroom and designing your lesson plan. Bright lights, loud noises, and certain textures can all bother a child and interfere with learning. Provide your student with a safe area to go if he is feeling overwhelmed and needs to unwind. An unused conference room or even a quiet corner in your classroom can help the child feel safe. Do keep parents informed of any instances involving the child, socially or academically. Ask for the parent's help when situations arise that are problematic for the child or the classroom. Be proactive rather than reactive as much as possible. The development of a curriculum that fits the needs of the student is critical, but understanding autism and its effects on education is also important. Socially and academically, each child that has autism will have different symptoms of autism and different learning abilities. At the start of any school year, parents and teachers should come together to find the method of teaching that works for that child. Both parties need to be receptive of the other's information and knowledge in order for there to be progress. The good news is that children do love to learn and will flourish within the right environment in many cases.